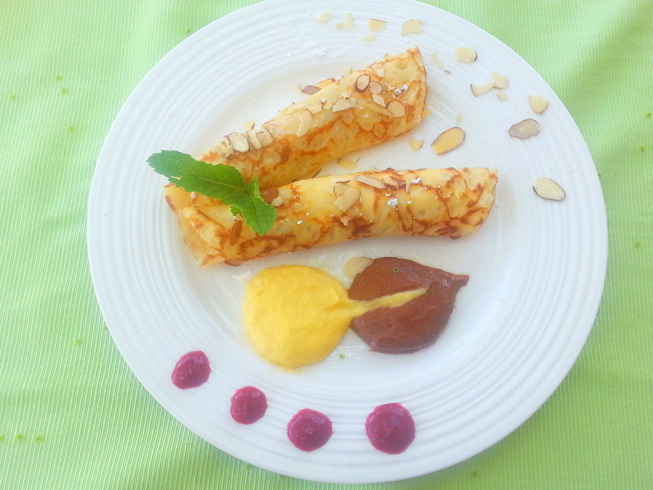 Orange Crepes with vanilla and chocolate orange cream. I have an amazing mom; whenever she visits, she brings food to our house. She used to bring sweets, cheese, sausage, candy and bread from the Russian store. Everything was extremely good, and yet extremely bad health wise. I tried to convince her to stop bringing food over, but she’s relentless ( “its not for you it’s for y0ur kids”). Eventually I convinced her to bring fruit and veggies, but she brought them in gargantuan amounts. A few weeks ago, she brought 10 lbs of oranges. We juiced them, ate them raw, made smoothies from them and even baked a whole chicken stuffed with them and there were still two left. Inspiration came as I was going through my daily routine: I passed by a creperie one day, another day an ad for Grand Marnier popped up on New York Times site, while grocery shopping Lindt chocolate bar “Intense Orange” caught my eyes. And then I knew what to do with the oranges. Crepe Suzettes!!! However as I was looking through the different recipes I realized that I have too few oranges to make Crepe Suzettes, but I already had my mind set. And that’s what inspired the following recipe. Start slowly adding flour in batches, until the dough is a buttermilk consistency. Pour the dough into a bowl and cover with plastic wrap and let stand alone for about 30 minutes, or refrigerate for up to two days. Place a 10″ skillet or crepe pan if you have one on medium low heat, add 1/2 teaspoon butter. When the butter begins to color but not smoke – the temperature is right. Lift the pan off the heat and, using a ladle or a small measuring cup, slowly pour enough batter to cover the bottom of the pan with a very thin coating. Return the pan to the heat and cook until the crepe bubbles. Gently turn crepe with a spatula or your fingers and cook the other side till it colors. On medium heat melt butter in a saucepan until it just starts to color, but not smoking. In a thin stream whisk 1/4 of the mixture into the egg yolks. Add another 1/4 portion in the same way. Add egg yolk mixture to the cream mixture and heat until it thickens a little. Divide the sauce into two bowls. Add chocolate to half of the sauce and stir to combine. ← Slow cooker Coq au vin. I can relate! My parents are the same way. Very tempting recipe. Will try it shortly. Thank you! 🙂 I’m glad you like it. I need to edit the recipe and indicate that the shot glass I used was 30 ml or two tablespoons.